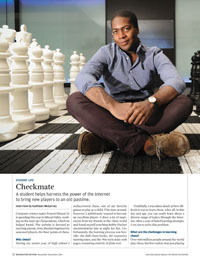 Computer science major Francis Hinson ’16 is spending this year in Silicon Valley, working on the start-up Chesscademy, which he helped found. The website is devoted to teaching anyone, from absolute beginners to seasoned players, the finer points of chess. During my senior year of high school I rediscovered chess, one of my favorite games to play as a child. This time around, however, I ambitiously wanted to become an excellent player—I drew a lot of inspiration from my friends in the chess world and found myself watching Bobby Fischer documentaries late at night for fun. Unfortunately, the learning process was horrific: the dull chess books, the expensive tutoring rates, and the ’90s-style static web pages consisting entirely of plain text. 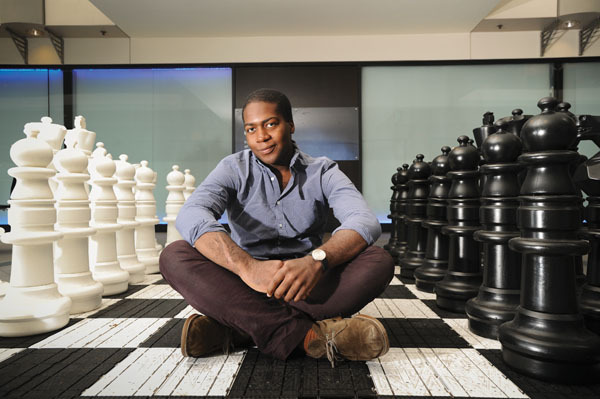 Truthfully, I was taken aback at how difficult it was to learn chess. After all, in this day and age, you can easily learn about a diverse range of topics through the Internet. After a year of failed learning attempts, I set out to solve this problem. What are the challenges in learning chess? Over 600 million people around the world play chess, but few realize that just playing will not improve your ability. There are many aspects of the game that need to be studied: openings, tactics, endgames, and calculation, to name a few. This is precisely the reason why there are many thick chess books and expensive private tutors: chess needs to be studied like a subject in school. For that reason, millions of people who don’t know how to play are intimidated by the game. And millions who do know and want to get better face the same challenges. With a wide range of instructive courses, interactive exercises, and thousands of tactical puzzles, players of all levels can learn from Chesscademy’s personalized curriculum that’s tailored to their strengths and weaknesses. By earning points, badges, and maintaining a streak, users are motivated to keep learning in a fun way. How did Chesscademy get started? I reached out to Andrew Ng, a friend with whom I’ve worked on entrepreneurial projects in the past—in this case, his skill set aligned perfectly: he’s a seven-time national chess champion. We then brought on another old partner, Sabar Dasgupta, a precocious high school sophomore who had already trail-blazed through Princeton University’s computer science curriculum. And thus, Chesscademy was founded. From June to August 2013, we put our skills together: Andrew developed comprehensive instructive courses, and Sabar and I developed the entire site’s architecture. I also entirely designed the Chesscademy interface. We worked remotely for two months, only video-calling at night to stay up to date with each other’s progress. August arrived, and we completed the beta version of Chesscademy. With a great deal of luck and some viral engineering, we managed to kickoff our launch with an immense amount of traffic—we made it to the front page of Reddit and to the top of Hacker News, a high-profile tech forum. We effectively discovered that my desire for an easy way to learn chess was something that thousands of people around the world also wanted. How do you balance school and work on a start-up? We returned to our respective schools and the weight of our responsibilities was simply too great to continue working on Chesscademy. Despite that, the site’s traffic continued to climb. By the start of the second semester, we collectively agreed that the opportunity to make Chesscademy something big wasn’t worth passing up. So Andrew and I took leaves of absences from Princeton and Rochester, and we moved to New York City to enter the entrepreneurial world. Through luck and connections, we managed to become affiliates to a prestigious technology start-up accelerator, Techstars. There we received mentorship and introductions to many prominent individuals in the New York tech scene. To keep ourselves financially afloat, we went to several competitions and earned over $10,000 in winnings. By mid-summer, Chesscademy had partnered with a prominent prep school on the Upper West Side and grown to 40,000 members. Through some more luck and hard work, we got accepted to Imagine K12, arguably the top accelerator for education technology, received a $100,000 investment, and moved to Silicon Valley. Today, Chesscademy has over 250,000 members from over 190 countries and continues to grow 10 percent weekly. Your company has been around for a year now. Where does it go from here? Our primary focus is to keep growing the community—by January 2015 we expect to have over half a million users. We’re also interested in incorporating the platform into the classroom environment to make Chesscademy a part of every school in the country. Eventually, we’re going to implement our business model, but for now, Chesscademy is free for the world to use. What is something most people don’t know about chess? In Russia and many other countries, chess is considered a sport! What’s it like to take a year off from your studies to work in a start-up? Taking the leave to work on Chesscademy has been the best decision of my life. Start-ups are extremely difficult enterprises, and you learn so much from success and failure. I’ve also been lucky enough to meet several prominent New York and Silicon Valley entrepreneurs and investors, and these connections will go a long way in my life. As a computer science major, this experience has also been extremely educational, as I’ve had to teach myself a lot of cutting-edge technologies and practices in order to develop a product like Chesscademy. When I return to campus, I imagine I’ll be a much more mature student.